WARN ~ a superior hub that operates reliably in all conditions! WARN, Premium Manual Hubs... 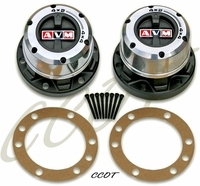 These premium locking hubs were a Dealer installed item on Land Cruisers 8/'80 and older. 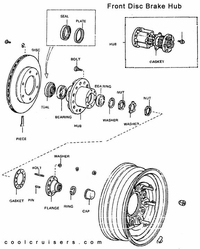 Hubs allow front end to disengage, reducing wear and tear and improving gas mileage. Premium Manual Hubs A testament to the dominance of Warn Premium Manual hubs can be seen everyday in pages of leading off-road publications. 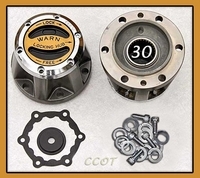 In photo after photo, feature after feature, close inspection reveals an overwhelming prevalence of distinctive brass dials and all metal bodies bearing the Warn name. 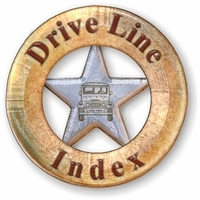 But it's more than a symbol of status or a demonstration of the vehicle owner's off-road prowess. Warn all metal Premium Hubs exhibit a long list of technical advantages no other hub can match. The external hub body is constructed of the practically indestructible ZA27 super alloy. Both utilize all metal components. 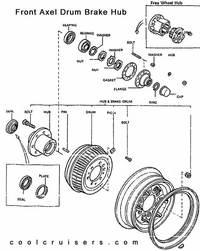 Inside the cap assembly, wave spring technology is used to enhance reliability. 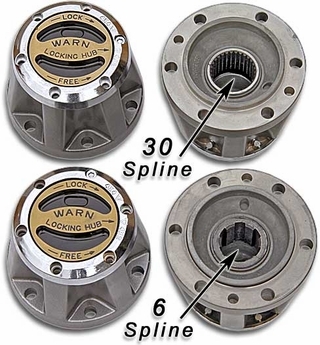 Longer clutch-ring spline teeth and body spline area result in better load handling. 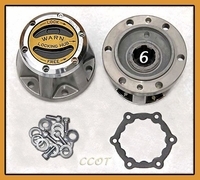 Warn Premium Manual hubs feature a larger body wall thickness to optimize clutch-ring strength. Rapid positive engagement prevents ratcheting, dual dial seals lock out contaminants, and a corrosion resistant, chrome-plated finish substantiates our goal of never-ending performance. 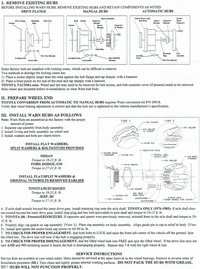 Warn hubs install in under one hour per set and are guaranteed. They're the best selling hubs in the world and the only hub made right here in the U.S.A.
NO RETURNS ON INSTALLED HUBS. 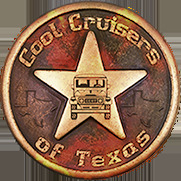 Because many Land Cruisers have had axle swaps, please check your axle for 6 spline or 30 spline axles. Order accordingly. Select 1 each Hub or 2 each Hubs below. Note: System will add $134.71 to base price for 2nd Hub. Note: System will add $168.64 to base price for 2nd Hub.